For me, Valentine's day is not just Valentine's day. It marks the day that TheHusband (then to-be) and I shared our first kiss back in 2004, three days after we met. Technically it was me who kissed him first - a thank you kiss for the rose he brought me - but he argues that that doesn't count. According to him the deal was sealed (so to speak) later that evening when he took me home. It was the goodnight kiss that lasted a lifetime - or at least felt like it did - and we didn't care who saw us. We were after all in full view of anyone who happened along, being in the front garden of my university dorm. Ah, young love! But with all that being said, Valentine's is just a blip on our radar. Yes, it marks our first kiss and it is of course the universally acknowledged "Day of Love", but for us, the whole month of February is a romantic one. Not only did we meet and share our first kiss in the month of love, but TheHusband officially asked me to be his girlfriend ('cause that's how gentleman do it!) on the 24th. We also went ahead and tied the knot exactly three years later. So yes, Valentine's is lovely and it's lovely to be in love, but for us, the bigger fireworks are reserved for a few days later. We celebrate Valentine's day itself in a much more low-key fashion, which honestly, feels much more sincere to me. It's about the entire journey, you know? So we spent this past (long) weekend together, just pottering around at home, enjoying each other's company and talking about our dreams. TheHusband bottled his first batch of home brewed beer (because nothing says romance like beer right?) 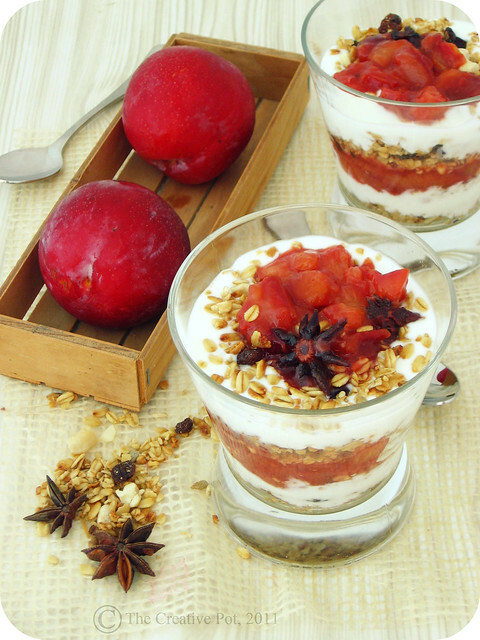 on Saturday and on Sunday morning I made this spiced plum parfait for breakfast. The ruby red colour of the plums and the warm, aromatic spiciness brought just the right amount of elegance to the breakfast table, without feeling overdone. Just how I prefer my romance too, in fact. So for every one of you out there who loves someone - remember it's about more than just today. And for TheHusband - it just keeps getting better. 1. Add plums, star anise, cinnamon, sugar and water to a small saucepan and cook for 10 - 15 minutes over medium heat or until soft and fragrant. Liquid will have reduced - if not, cook for a few more minutes over high heat. 2. 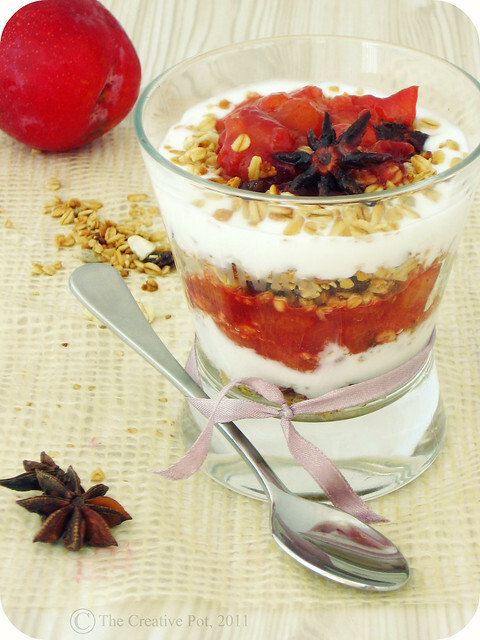 Spoon some granola or muesli into a pretty glass or bowl, follow with yoghurt and half of the spiced plums. Repeat, using the remainder of the plums, then serve. Try this with other fruits to ring in the changes - apples, rhubarb and apricots would all work splendidly. You can also try experimenting with the spices - add a touch of nutmeg or cloves in place of the star anise. My morning toast all of a sudden looks prety bleak!! Would love to dive into one of these babies!! Great story. Yummy looking plum parfait. What a beautiful dessert and such gorgeous, romantic photos! I love the way you and TheHusband look at the whole V Day and romance. I can't wait until plum season here so I can try this delicious dessert. Happy Valentine's Day! Such a great combination of flavors! What a beautiful story Marisa! That's how love should be! That dessert is so gorgeous and so fitting with those lovely colours. Wow! Awww - this is sweetest post ever! Happy VDay. (Oh - and this parfait - GORGEOUS). oh...i'm in love with this sweetest parfait....! They look gorgeous! Lovely dessert! The month of love...I like that. Especially since my birthday is in february. So it means I'm a love child! This parfait looks absolutely delicious. Perfect for when plums are FINALLY in season again! That sounds delicious. I have never tried making spiced plums - very nice. Happy Valentine's Day. Parfait me! The only kinda I've ever had was from KFC when I used to eat that fast food crap. I wonder what REAL parfait tastes like. I wants it! This looks so delicious and that colour is beautiful! What a pretty parfait and perfect for a summer dessert. so lovely! can't wait for summer to arrive with her happy plums! This sounds like a lovely breakfast combination. 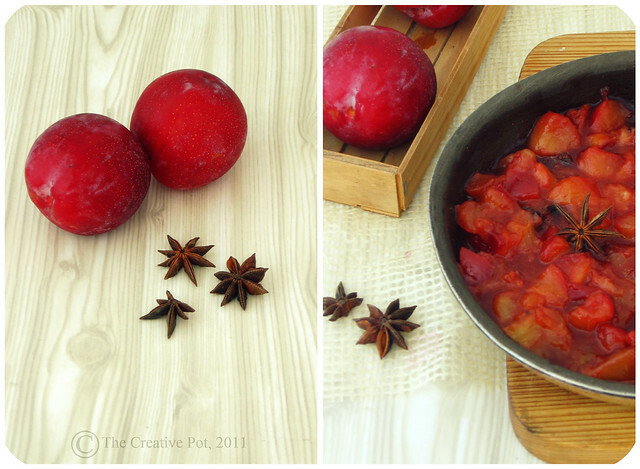 I haven't tried star anise with plums, but can almost taste it now! It certainly works well with guavas, when they come back into season - not long now!